Hi, I'm Young Master Luma! You might also know me as LpSamuelm, or very much more recently, obskyr. I joined this wiki in 2010, as a young boy with ambition and energy. I put up a user page with all sorts of strange information. I wrote some slightly horrible HTML and wikicode. I dug myself into the depths of userbox culture and socialized with the other users. Then again, I also made some valuable contributions! Mostly tense fixes and page cleanups, but also some substantial informative paragraphs and hard-to-get screenshots. I fixed RPG enemy statistics, I voted in proposals, all of those things that really do make the wiki better. Time went on, however, and by late 2012 I wasn't really to be seen anywhere. I might come by here every once in a while and fix some things up, though! If you dig through the history of this very page (pfft, who would even want to do such a thing) you might find some strange, wonderful, interesting and uninteresting things I wrote as a youngster. Then again, you might also not find any of that. You may be wondering; why am I named Young Master Luma? 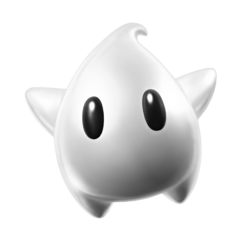 Because that's the name Luma used in Super Mario Galaxy 2. You may also be wondering; why do I often have silver-themed stuff? Well, that's becaue of a misunderstanding, I originally thought that Young Master Luma was a completely different character from Luma - I suppose my TV's color was off. Turns out it's the same character, and now the whole thing is just a relic of times past. I'm a guy from Sweden who enjoys playing all sorts of video games. Before you ask; no, we do not eat dogs and yes, we're called Swedes. As a tiny four-year-old, I received a Game Boy Advance and a copy of Yoshi's Island, and I just never stopped playing. A good while in the future, I am still going and still showing as much interest as ever in video games, and I still have an interest in trying to put a dent (a good, contributive kind of dent) in the community. This page was last edited on March 6, 2014, at 05:46.